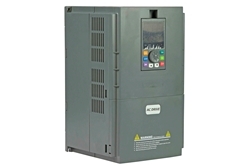 Variable frequency drives (VFD) are cutting-edge devices used in a drive system consisting of three main sub-systems: AC motor, main drive controller assembly and drive-operator interface. The units can also be used to control motor speeds, resulting in reduced energy consumption and preserved lifespans for connected machines. To improve drive performance and reduce the creation of harmonic currents, VFDs can be protected by an isolation transformer. In such setups, the transformer ensures incoming AC voltage being fed to the VFD is ‘clean’ before undergoing AC-to-DC conversion (more on this later). Determining the size of a transformer for VFD loads is a straightforward process. To start, individuals must select an appropriate kVA rating for the isolation transformer, sized to handle the VFD’s continuous input amps. At this stage, it is important to consider that you do not have to oversize the unit for the VFD, since the transformer already has current overload protection. *Note: The 1.732 multiplier, which is the square root of 3 [v3], is for three-phase kVA. After determining the appropriate kVA rating of the transformer, individuals should also double-check the primary and secondary voltages for compatibility. The primary voltage of the unit must match the input/supply line; while the secondary voltage must match the input requirements of the connected VFD. VFDs can contribute to harmonic distortion, which is defined as electrical pollution due to deviation from a pure sinusoidal wave form to a non-sinusoidal wave form. Harmonic currents consist of greater (odd or even) multiples of the fundamental, sinusoidal wave form. For example, the 5th harmonic of a 60 Hz network is 300 Hz. Even harmonic currents contribute to less machine performance issues, than odd harmonic currents. The presence of harmonic currents is a concern for VFDs, because the units generate non-linear loads. When visually presented, the waveform of a non-linear load appears random and staggered. It is important to highlight that harmonics are only an issue when the amount of current exceeds certain limits or thresholds. Isolation transformers can be used to decrease the creation of harmonic currents, by rectifying input current from the supply line to the VFD. For protection against unwanted electrical disturbances, the unit’s primary and secondary windings may be covered with an electrostatic shield. Alternatively, it would also be possible to use multi-pulse drives (12, 18 or 24-pulse), trap filters and broadband filters to decrease harmonic distortion, when using VFDs. ANSI/IEEE Standard 519 and IEEE C57.110 provide recommendations for mitigating harmonic currents in industrial facilities.